St. Mary School hosted a Thanksgiving feast on Nov. 21. 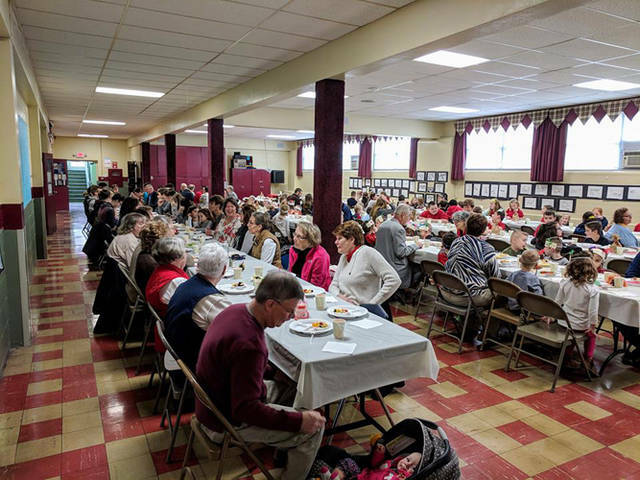 GREENVILLE – Beginning first thing Monday morning and all the way through Wednesday, the students of St. Mary School spent Thanksgiving week preparing home-cooked food for more than 160 honored guests, students and staff expected for the feast on Wednesday. The school, led by Principal Vern Rosenbeck, welcomed Rev. John White, pastor of St. Mary Church, Deacon Tom Graber, parish staff, education commission, parish council, St. Mary School board of trustees, volunteers and alumni. Also attending was Susie Gibbons, superintendent of Catholic schools for the Archdiocese of Cincinnati, and Karyn Hecker, regional director for the Dayton and north schools. Recent graduates of St. Mary School filled up several tables. The students currently attend Greenville, Arcanum, Franklin Monroe, Mississinawa Valley and Tri- Village high schools. Mom and dad volunteers assisted the students all week. The eighth graders began the preparation making pumpkin pies on Monday. Tuesday was a flurry of activity with seventh graders roasting the turkeys, sixth graders preparing the potatoes for cooking, grade four cleaning vegetables, and grade five making dip. After lunch on Tuesday, second graders washed the fruit for the fruit salad, and first graders prepared the stuffing, even managing to make Rosenbeck’ s request for a special dish of raisin stuffing. On Wednesday, after attending Mass at St. Mary Church and snacking on the veggies and dip prepared by fourth and fifth graders, the students were back to work. Kindergartners cooked the corn and beans with some mom help, second graders finished making the fruit salad, sixth graders cooked and mashed the potatoes, and third graders prepared the only store bought dish: noodles cooked in broth. The preschool butterflies were in charge of the punch. Table decorations were created by preschoolers, kindergarteners, first graders and second graders. White led the students and adults in prayer, and immediately after prayer the student council members began delivering bowls, dishes and platters of the food that the students had prepared. Throughout the gathering, staff and guests were seated next to students and were enjoying the food, served family style, assisting the youngest and sharing in conversation. White closed the celebration with a prayer and student council members boxed up all of the leftovers, which were delivered to agencies in the area that serve the less fortunate. Finally, the student council cleaned up the cafeteria before joining their classmates for the rest of the school day. The lessons learned and the blessings received will go well beyond the days spent preparing and enjoying the feast, school officials said.